The drills would be a first of sorts. The two countries' forces have not previously trained simultaneously in the air, on the land and at sea. The two countries also signed an agreement to enable exchange of sensitive military information securely. The US and Indian militaries will carry out large-scale joint exercises off India next year, top officials said Thursday. The drills would be a first of sorts -- the two countries' forces have not previously trained simultaneously in the air, on the land and at sea. 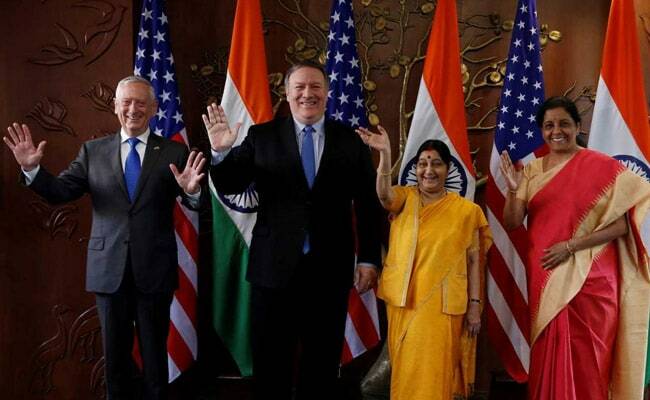 Defence Minister Nirmala Sitharaman made the announcement at the end of a summit with US Defence Secretary Jim Mattis, Secretary of State Mike Pompeo and Indian Foreign Minister Sushma Swaraj. "We have decided to carry out for the first time a tri-services joint exercise with the United States off the eastern coast of India in 2019," Ms Sitharaman said. The two countries also signed a "Communications Compatibility and Security Agreement", known as COMCASA, that will enable them to exchange sensitive military information quickly and securely. Mr Mattis and Ms Sitharaman signed the COMCASA agreement at a brief ceremony earlier Friday. Washington however is concerned about an imminent deal India is making with Russia to buy the S-400 missile system. India and the US also vowed closer cooperation in counterterrorism operations.